Seven Whitebait Stood Vertically In A Small Wire Mesh Basket! Closed for refurbishment when I last walked by but it just seems the same, refreshed, but still the same. The ‘swanky’ Trafalgar has, for at least the last ten years, been a victim of its own history and burdened down by its importance but perhaps I am missing the point of the Trafalgar – it always has been a dining Inn. It has been a ‘cool place to eat’ for nearly 200 years so why should it change now. All the tables are laid out for meals, knives and forks and serviettes, windows open for a breeze from the river, couples eating lunchtime food and mere drinkers abandoned to the serried ranks of the outside tables, all numbered and regimented – but what if it rains! It stands on the site of the Old George Inn, one of the original and best loved of Greenwich’s taverns and when The George was rebuilt and extended in the 1830s, the inn was renamed to commemorate Nelson and his famous victory. The Trafalgar was a favourite haunt of Dickens, with ‘Our Mutual Friend’ set around the town. Political and private groups gathered to partake and even Ministers sailed down the river from Westminster to dine at the Inn, long famed for its whitebait suppers, drink and hospitality. At the end of the 19th century, the inn deteriorated into no more than a beer house and it closed its doors in 1915 and remained closed until 1965 when, against a background of much destruction, it was decided that The Trafalgar should be restored to recapture its former charm and comfort. So much for the history, the reality today is a little different. I’m not sure that Dickens or the Cabinet would travel down the Thames for a portion of seven whitebait stood vertically in a small wire mesh basket although now, they are served on a board but it was still not the ‘supper that they would have expected. On that Saturday a few years ago, everybody and the world, including our group of 1066 walkers, struggled for service and for somewhere to sit. It was expensive and not very enjoyable and I have not returned since until today. It is still a smart place to eat, the river views are great, boats and clippers provide entertainment, the merchants towers of Canary Wharf are opposite and the ‘Dome’ seems close enough to touch. Cask beers were: Adnams Mosaic Pale Ale, Freewheel and Ghost Ship, Nelson Brewery Trafalgar and Admiral IPA and Sharps Doom Bar but I felt that having to drink outside in the heat was not for me – I went next door to The Yacht. Pop in for a taste of history but beware that there are other pubs that can offer a little more solitude for that end of walk pint. Beer Notes will be published in 2019 as a ‘must have’ accompaniment for the discerning walker on ‘Walking 1066 Harold’s Way’ – The Trafalgar. Whitebait suppers, politics and intrigue will be No 17. The Trafalgar is on the route of 1066 Harold’s Way. This Bird is dead, deceased, gone to meet its Maker. The Woodcock is no more. What sad tragedy it is that walkers will never feel the warmth again of the fire on winter walks or sit in the garden on a summer’s day. Isolated and weather boarded, remote down its country lane that led to Dingleden and little else, it was supported and enjoyed by all who discovered its charms. It was always a walk leader’s nightmare for every group would want to stop and savour its delights and bang their heads on the beams inside. The Woodcock sat by the footpath from Sissinghurst to Bodiam Castle and I found its charms irresistible when researching and walking both 1066 Harold’s Way and Three Castles but now the doors are shut and its lease for sale. It was once a freehouse and served as a ‘gentlemen’s club’ for the owner, who delighted in serving Goacher’s excellent beers and food to satisfy, but he retired around four years ago and Greene King became the owners, offering a tenancy and a beer tie for dreamers. The rest is history but its reputation will continue with the hope that the Woodcock will fly once again to the delight of every walker who passes by. Beer Notes will be published in 2019 as a ‘must have’ accompaniment for the discerning walker on ‘Walking 1066 Harold’s Way’ – the long-distance walk from Westminster Abbey to Battle Abbey and Hastings Castle inspired by King Harold’s epic march to the Battle of Hastings 1066. Burton St Leonards was the first new seaside resort for the wealthy and became instantly popular with royalty and aristocracy. There were service areas for the new town; Mercatoria for shopping, and Lavatoria for laundry. 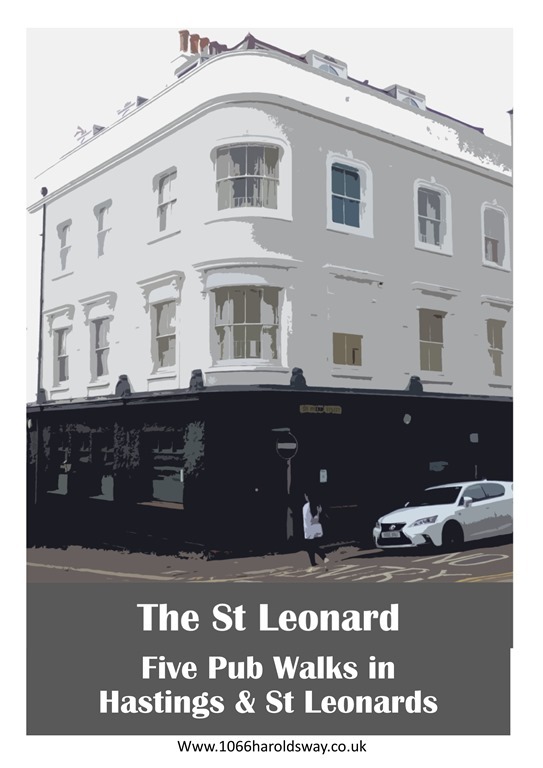 ‘The Horse and Groom’ was St Leonards’ first pub, built and licensed in 1829 for the benefit of the workforce busy constructing the new town of St Leonards. It is on record that they were so thirsty that the pub opened before the windows were installed. Workers also came to the Horse and Groom on Saturday nights to be paid their wages and were called in from the street one by one. They came again on Sundays to quench another thirst, this time to listen to the newspapers being read aloud. Edward Thebay was ‘Sunday reader’ at the Horse and Groom for many years. (Hastings Pub History). Thirsty workers/walkers still seek out The Horse and Groom. Warm and friendly, the two rooms are separated by a horseshoe bar and a back room for larger groups. The beers, Harvey’s Best and one or two guests, are always good and you get the feeling of a proper pub with no taped music, no food (just cobs on the bar, if you are lucky) and eclectic decoration. A quiet, atmospheric, dog friendly pub where you can enjoy good conversation and when I visited, the guests were Young’s Winterwarmer, Longman Long Blade and a fine Green King Abbot that slipped down a treat. Pub Walks in Hastings and St Leonards is available from Hastings Tourist Information, Hastings Pier and from The Bookkeeper, Kings Road, St Leonards and by mail order.